Bryan Dean Cutler is a Republican member of the Pennsylvania House of Representatives for the 100th legislative district. He was first elected in 2006, defeating incumbent Gibson C. Armstrong. He is the Republican Majority Whip, having been elected after the 2014 elections. Cutler was born in Peach Bottom, Pennsylvania and attended Solanco High School. He graduated from Lancaster School of Radiology in 1995 and earned a bachelor's degree from Lebanon Valley College in 2001. He worked as an X-Ray Technologist at Lancaster Regional Medical Center and as a Manager of Support Services at Lancaster General Hospital. In 2006, he earned a law degree with a Certificate in Health Care from Widener University School of Law. He served on the Drumore Township Planning Commission and represented Drumore Township in the Regional Planning Commission. He was first elected in 2006, defeating incumbent Gibson C. Armstrong, who voted against the controversial 2005 legislative pay raise. His father, Senator Gibson E. Armstrong, however, supported, voted for and took the pay raise, and voters took their anger out on his son. ↑ "SESSION OF 2007 191ST OF THE GENERAL ASSEMBLY No. 1" (PDF). LEGISLATIVE JOURNAL. Pennsylvania House of Representatives. 2007-01-02. Retrieved 2009-01-09. ↑ "2006 General Election - Representative in the General Assembly". Commonwealth of PA - Elections Information. Pennsylvania Department of State. 2004. Retrieved 2009-01-09. 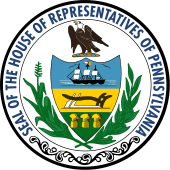 ↑ "Officers of the Pennsylvania House of Representatives". Pennsylvania House of Representatives. Retrieved 3 April 2015. 1 2 3 "Representative Bryan Cutler (PA)". Project Vote Smart. Project Vote Smart. 2008. Retrieved 2009-01-09. ↑ "Rep. Bryan Cutler Biography". Pennsylvania House Republican Caucus. 2008. Retrieved 2009-01-11. ↑ "GET TO KNOW BRYAN!". RE-ELECT BRYAN CUTLER. Friends of Bryan Cutler. Retrieved 2009-01-20. ↑ "County GOP voters reject 3 incumbents". Intelligencer Journal (Lancaster, PA). LancasterOnline.com. 2006-05-17.